Headings and subheadings organize your content and are important for usability and accessibility. People with limited or no vision depend on screen reading software to read aloud the text that appears on the screen. Using headings properly provides a hierarchy of content that allows users to navigate more efficiently. 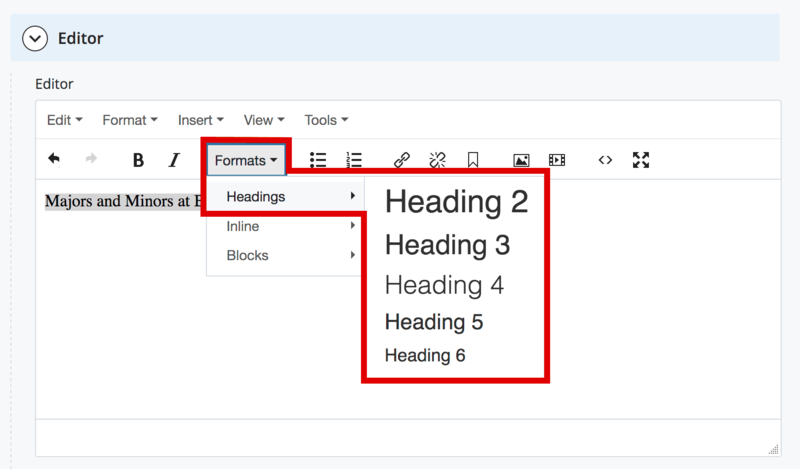 Always use the pre-formatted headings in the Formats dropdown of the WYSIWYG editor. Do not bold paragraph text to create the look of a heading. A screen reader will not recognize it as a heading. Nest all headings numerically: H2 comes before H3, H3 comes before h3 and so forth. You can use a level more than once, but do not skip a level. Heading 1 is your Site Name. Do not use Heading 1 in your main content area in the CMS. Heading 2 is your Page Title. 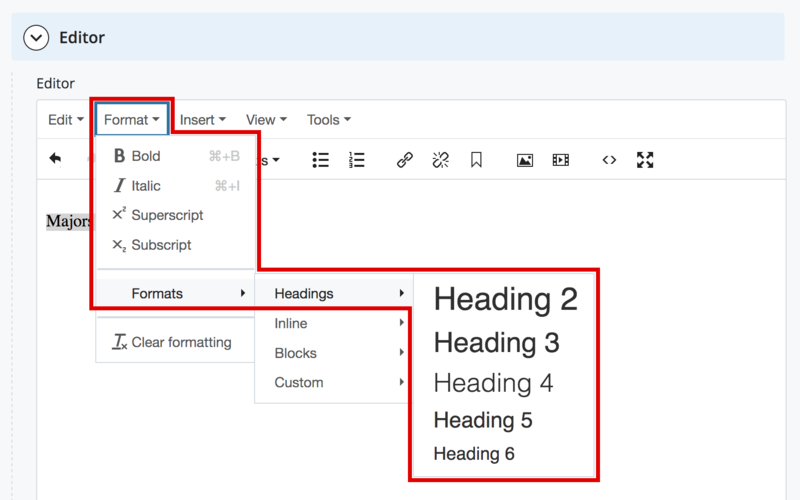 Do not use Heading 2 in your main content area in the CMS. Heading 3 can be used in your main content area. It should be the first heading you use on any CMS page. Heading 4 can be used in your main content area. It should be nested below Heading 3. Heading 5 can be used in your main content area. It should be nested below Heading 4. Heading 6 can be used in your main content area. It should be nested below Heading 5.